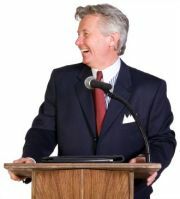 Here you will find some of the best Retirement Jokes for your retirement speech, and your retirement party. Humor is a lighthearted and playful way to look at retirement. Are Retirement Jokes the best medicine for seniors? Laughter really is the best medicine for seniors, and medical science confirms this. I inherited my sense of humor from my parents. I love to share jokes, and when I hear a good one I write it down. My schooldays were in an era of strict discipline and corporal punishment, occasionally relieved by the teacher, or a student, telling a funny story. In my corporate life I sometimes told humorous stories to relieve tension, foster creativity, and create rapport. You might want to include some of the following in your Retirement Speech - or combine with some Retirement Quotations. Question: When is a retiree's bedtime? Answer: Three hours after he falls asleep on the couch. Question: How many retirees does it take to change a light bulb? Answer: Only one, but it might take all day. Question: What's the biggest gripe of retirees? Answer: There is not enough time to get everything done. Question: Why don't retirees mind being called Seniors? Answer: The term comes with a 10% percent discount. Question: What is the common term for someone who enjoys work and refuses to retire? Answer: Nuts! Question: What is the best way to describe retirement? Answer: The never ending Tea Break. Question: What's the biggest advantage of going back to school as a retiree? Answer: If you cut classes, no one calls your parents. Question: Why does a retiree often say he doesn't miss work, but misses the people he used to work with? Answer: He is too polite to tell the whole truth. At some stage retirees must accept the fact that retirement and reduced roles are ultimately a reflection of ones reduced capacities and motivation. Yet retirement jokes enable us to laugh at our predicament and avoid despair! No one expects you to run...anywhere. People call at 9 pm and ask did I wake you? In seeking a retirement job you may be unfamiliar with the current argot (sic) of the profession. And some of these descriptions are not retirement jokes! Another year has passed and we're all a little older. We used to go to weddings, football games, and lunches. We used to go out dining, and couldn't get our fill. Now we ask for doggie bags, come home, and take a pill. Now we get sore behinds from riding in the car. So, enjoy each day and live it up... before you're too darn old! Here is an exercise suggested for seniors, to build muscle strength in the arms and shoulders. It seems so easy, so I thought I'd pass it on to some of my friends. Just don't overdo it. After a couple of weeks move up to 10-LB sack, then 50-LB, and eventually try to lift a 100-LB potato sack in each hand, and hold your arms straight for more than a full minute.